Yet again I'm behind on reviews. Since the beginning of May I've read three books and not had a moment to review any of them... admittedly I have been away for a week in Cornwall so that explains it a bit. So, this is yet another catch up post from me. 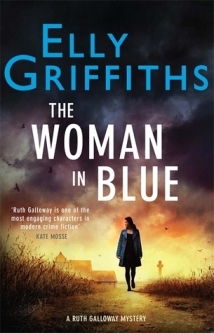 First up, The Woman in Blue by Elly Griffiths. Ruth Galloway's new-age, Druid friend, Cathbad is cat sitting in the historical village of Walsingham in Norfolk. Out searching fot the cat one dark night he sees a vision of a woman in blue in the graveyard. Cathbad being Cathbad this doesn't bother him much until a body is discovered in a ditch and it's a woman, or 'the' woman in blue. DCI Nelson is brought in to investigate and it's not long until Ruth is brought in too via a friend who's a female priest who's been recieving hate mail. Ruth's not thrilled about this: Ruth and Nelson's daughter, Kate, is now five but Ruth has still not really come to terms with her feelings for her married daughter's father. Why does life have to be so damn complicated? Yet another superb instalment of Elly Griffith's Ruth Galloway series. I've loved every single one and this was no exception. I love the humour in them, the mysteries are always historically based, which suits me, and although I find Ruth and Nelson's relationship a bit frustrating... it's real. Life is messy like that for some, there are no easy answers and Ruth's struggles make me feel so sorry for her. Long may this series reign. 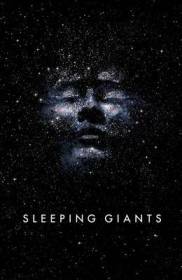 Next, Sleeping Giants by Sylvain Neuval. A young girl, Rose, is desperate to try out her new birthday present, a bike. She rides it into the woods at Deadwood, South Dakota, and literally falls through the ground, into a giant metal hand. 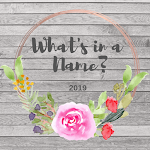 Many years on and Rose is a prominent scientist in charge of the project to recover the separate parts of what turns out to be a giant robot, buried thousands of years ago... but by whom? Not saying any more about this book as it would involve spoilers and for my money it would be shame to know too much about this unusual book before starting it. It's written, rather oddly, in the form of interviews by an unknown person with the main characters in the book. It's quite original and makes for a pacey read, I found it to be quite the pageturner. This is the first book in what I think is going to be a trilogy. Book two, Waking Gods, is just out I believe. I shall be reading it. Lastly, a non-fiction book, Best Foot Forward by Susie Kelly. I seem to have been in a bit of a French mood for some months and having a lot of fun. I'm enjoying the Jacquot murder books set in the south of France and various other books set in France have crossed my path recently. 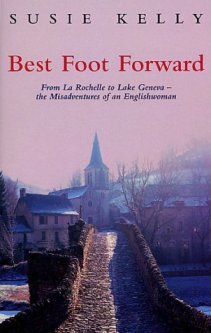 Including this non-fiction account of the author's walk across France from La Rochelle on the Atlantic coast to Lake Geneva. Susie Kelly was in no way a hiker or camper when she decided to embark on this epic journey, she pretty much suffered every step of the way and her descriptions of the state her feet got into were quite harrowing. But this was a really enjoyable recounting of the people she met, the landscapes she walked through, and how much she got lost. I really enjoyed it all, the author writes engagingly and honestly about her failings and triumphs. I shall look for more books by her. A couple of short book reviews today. First up, A Murder of Magpies by Judith Flanders. Samantha Clair is a publishing editor at a firm of book publishers. She's in her forties, single by choice and has a mother, Helena, who's a high-flying lawyer. She normally deals with contemporary fiction of the light, romantic kind but her friend and fashion writer, Kit Lovell, has written a book about the death of fashion designer, Rodrigo Alemán. Reading the manuscript, Sam realises that what it contains could be explosive and sets about passing it through their team of libel lawyers. Then Kit disappears and Inspector Jake Field comes into her life. It soon becomes apparent that there's a lot more going on than just Kit's disappearance that may or may not be because of his unpublished manuscript. Sam, Jake and Helena set about investigating, Sam soon finding herself going further than Jake has authorised because all she really wants to do is find Kit - whereas the others seem to have developed quite another agenda. It's so nice to have a protagonist who's not young and glamorous and twenty-something. Sam is a very ordinary woman in her mid-forties, funny, intelligent, realistic about the world. She's also a loyal friend who is doggedly determined. I loved her dry, sarcastic wit usually aimed at the realities of the publishing world. 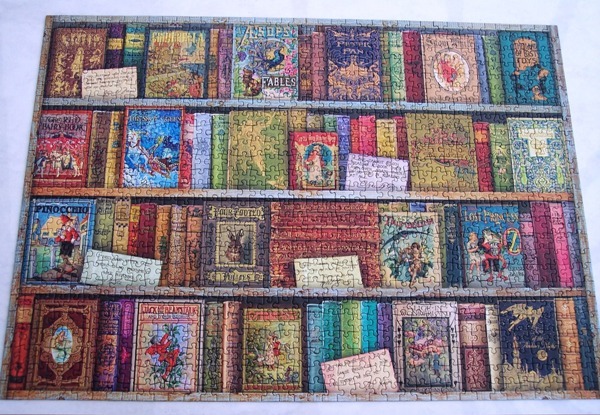 Interesting to read about that, we readers have very little idea how the books we love get published and this book gives a small glimpse into that hidden world. The spotlight was also turned on the fashion world, which is not really my thing but nevertheless it kept my interest. This is a light, amusing crime read, very much London based, 'different' in that it's not police procedure based at all. Oh and I loved Sam's lawyer mother, Helena, whom Sam is convinced is a Martian. There are three in this book series so far so I'm hoping to come across more on my travels. Lastly, Just One Damned Thing After Another by Jodi Taylor. Madeleine Maxwell, known to all as Max, is recruited to a department of Thirsk University known as St. Mary's. It's an Institute of Historical Research... but with a difference: the historians who work there can travel in time. Their purpose is to "investigate major historical events in contemporary time." To find out the truth of incidents that are in question. It takes months of training before Max and her fellow trainees are ready to make their first jump. Several drop out but Max is determined to succeed, not only that but to be the best. Eventually she and her fellow students are ready to take their place as fully fledged historians. Max travels to 11th. century London and joins the medical team at the front in World War 1. Then she lands a 'big one'... she's sent back sixty five million year to the Cretaceous Period. 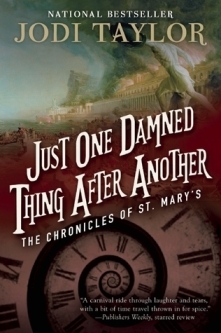 This assignment changes everything, for Max, for St. Mary's, and possibly the world. Well this one was recommended to me by book blogger, Geranium Cat, on Facebook. I have to admit for the first 50 - 60 pages I was a bit so-so about it and then it suddenly took off like a bat out of hell and was non-stop action and intrigue until the very end. And I mean 'intrigue'... all kinds of double-crossings and unexpected twists... I was exhausted come the end. It was huge fun, a lot humour in the dialogue and first person naration. 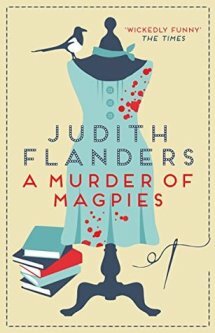 Interesting and entertaining characters - Max herself is a complicated and frustrating sort of person but I suspect there's a backstory there the reader may learn about in future books. There're quite a few of them, nine I think, with a lot of short stories and novellas in between. I'll certainly read more if I can get my hands on them.